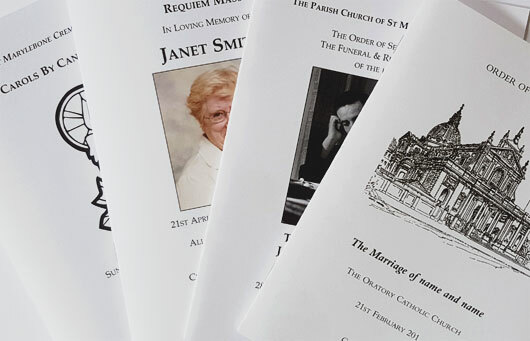 We design and produce high-quality Order of Service booklets for a variety of religious and non-religious ceremonies. We are specialists in the design of funeral Orders of Service. Classic house styles can be modified and adapted to suit the style you want. A variety of images and photos can be incorporated into your design. Photo montage services also available, please phone to discuss as needed. N.B: It is best to discuss with the Celebrant, Minister or whoever is conducting the service prior to ordering. Then submit the text they provide you. We will advise you of any commonly made additions to the information you provide us.